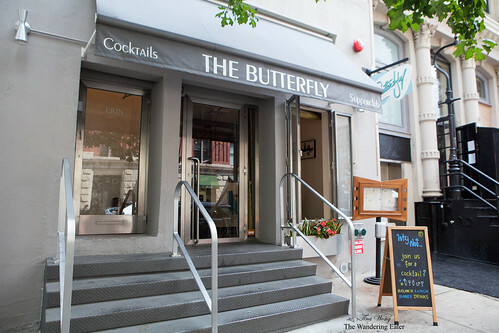 Chef Michael White’s newest venture opened in late June of this year called The Butterfly. 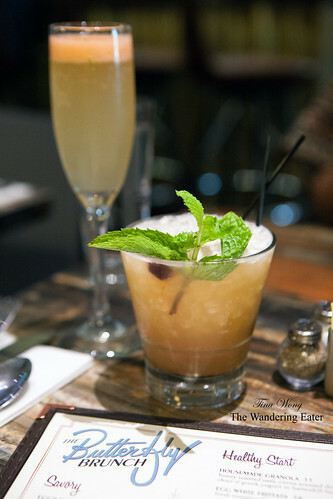 This is place is meant to be a place for well made cocktails (the drinks menu is collaborated with one of the most respected bartenders in the industry, Eben Freeman (if you could recall the olden days of Tailor with the solid cocktails)) that serves very good retro American food. The retro theme of the 1950s are nuanced throughout the restaurant from the font on the menus, the classic cocktails like Mai Tai and The Grasshopper to the sleek bamboo bar. Surprisingly, it’s not crushed by the brunch loving crowds when we were there at 1 PM; it was pretty calm but with some clamor from a small family dining toward the front and hums of conversations floating around. 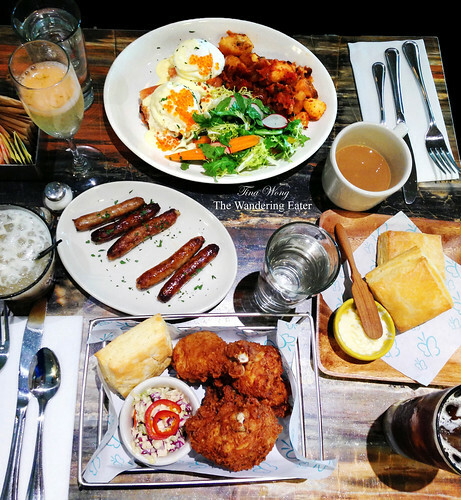 We thought The Butterfly would be a good idea to have our hangover brunch of sorts that would be incredibly delicious and satisfying to kick off our Sunday afternoon (or morning for us). Hence the huge spread above. Before all of that food arrived, we did started off with coffee and chased it with a very balanced Mai Tai ($15; Garam Masal Brugal 1888 Rum, Marie Brizard Curaco, lime) and the Paloma ($14; Herradura Reposado Tequila, San Pellegrino Pomelo, Aperol). I liked the Paloma more because its sweetness was balanced by the bitter-tart grapefruit foam that topped this cocktail. The Norwegian Benedict ($23) could ease your hangover (or at least satiate your hunger) as this platter was substantial. 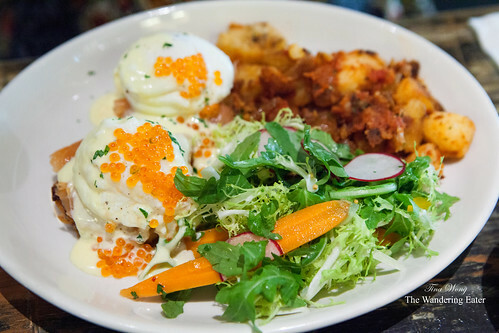 Two crisp potato pancakes topped with slivers of salty smoked salmon, poached egg and hollandaise sauce with a sprinkling of trout roe with a side of house salad (the other option was home fries but my friend wanted both). It’s decadent and very tasty. I wanted the fried chicken basket ($17) because I miss having fried chicken and I know Chef White’s kitchen is very capable of making very good fried chicken. This stainless steel basket arrived to our table as a 3-piece (drumstick, breast and thigh) from Bell & Evan’s with a side of coleslaw and a biscuit. When I got my hands on the chicken thigh, I was blown how incredibly juicy the meat underneath that craggy, crisp dark golden exterior and it was seasoned well that I didn’t even have to add ketchup (maybe I would have asked for hot sauce but it would change the flavor profile). 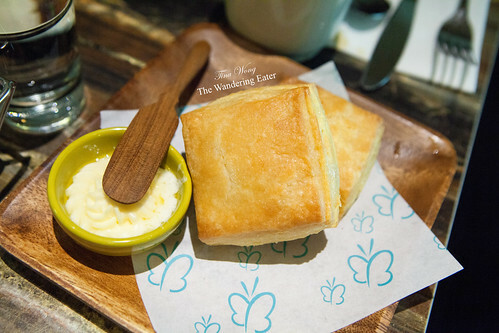 The warm biscuit was buttery, flaky, fluffy with a hit of salt. I would eat these biscuits by the half dozen! 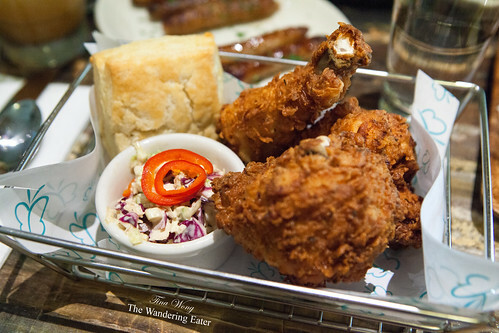 It’s really that great and it’s the fried chicken basket of my dreams. In all technicalities, their dessert menu for brunch (at this time of publication) is from their lunch menu. The dessert menu is a bit unusual as it listed a “glass of milk” as part of the menu along with a lemon meringue bar, oatmeal cream pie, and the Magic Bar ($6) you see above. 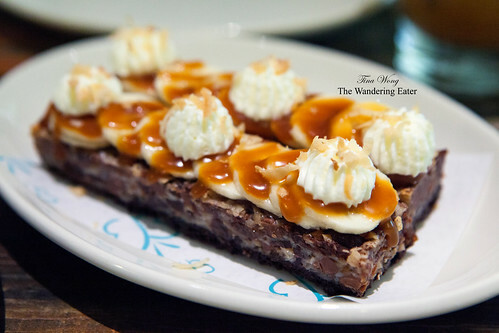 The magic bar is a dense fudge and coconut cookie bar topped with thinly sliced banana and caramel. For me, this confection was too sweet and rich to end our (already decadent) meal but my sugar loving friend liked it. The Nutella French toast topped with bourbon glazed bananas and fresh strawberries ($15) is technically from their brunch menu but to us it reads dessert. 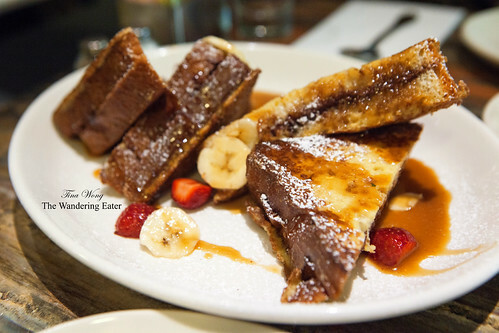 This fared out better in terms of sweetness (to me, at least) and the French toast was well executed – thick Nutella sandwiches soaked enough barely sweetened egg custard that crisped nicely then drizzled in not too sweet bourbon caramel bananas. 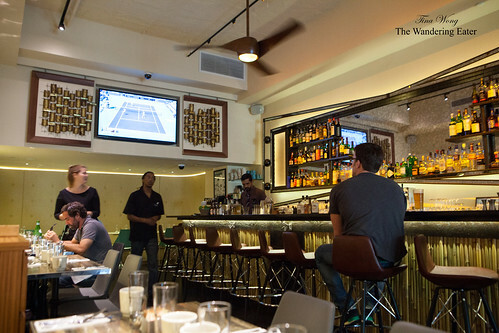 In all, The Butterfly is a great place for brunch and drinks. 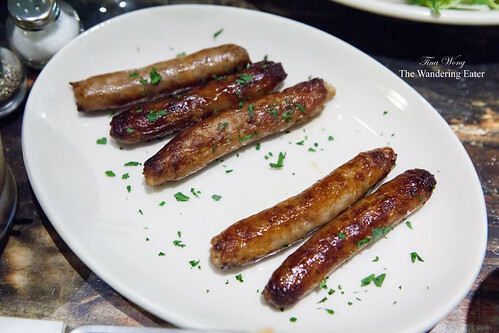 I am considering to head down there for dinner sometime soon.